Tsw: Not Long Until Long Island! Discussion in 'Dovetail Live Article Discussion' started by TrainSim-James, Nov 14, 2018. 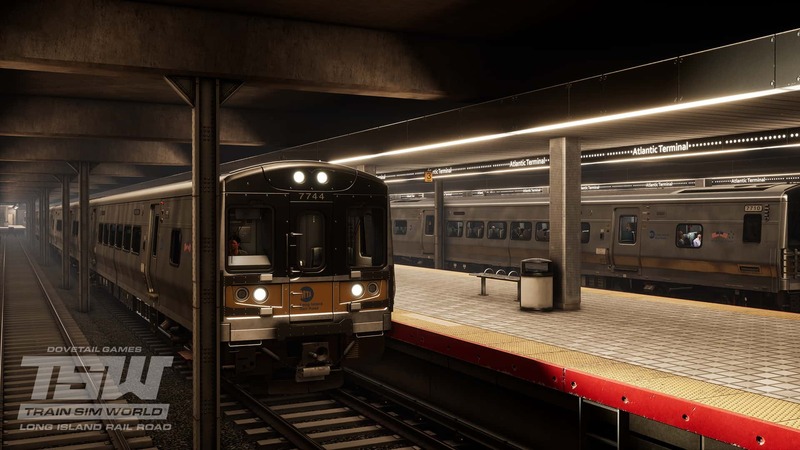 Long Island Rail Road: New York – Hicksville route for Train Sim World will launch on 20th November for Windows PC. Will there be a developers stream upon release? Wow! The passengers didnt bug at all. Did you fix the issue overall or do we have to buy this dlc to get to play with non-braindead passengers? Hope its not the second option as Im definitely not going to buy this dlc because your DLC policy is by far worse than EA's and Im definitly not going to support that. This looks so amazing! I can’t wait to try it! Any plans for a patch? There might be one on release of LIRR. It’s been a long ride honestly... always wanting LIRR in a Train Simulator. Can’t wait for the 20th! Dude, they haven’t said anything about consoles yet... it’s not helping to constantly ask. When they say something, they say something, unfortunately that’s how it is with them. Just wait, you’ll have it soon enough. You trying to spread false rumors? I’ve seen so many times on articles and Twitter posts etc. that the route will INITIALLY come to PC and consoles after. You people have to read before saying something like that because their are people that will believe you who don’t know otherwise. the hell with my fiancee and wedding i just ordered top of the line gaming pc so i dont have to wait for lirr on console! will the passenger annoucements work. I'm afraid it was said. May have been on a live stream they said along the lines of ' we will be bringing console dlc release dates in line with pc'. They however didn't say when. I have neither the time nor patience to find it for you! As we've mentioned previously, it is our plan to have parity releases on all platforms but we're not quite there just yet. For the time being, until you hear otherwise from us, releases will come to PC first and consoles as soon as possible thereafter. If you assert something as fact but provide no evidence to back up that fact, you cannot be suprised when people then ask you to provide that evidence. If you had maybe said "it is my belief that..." then people can assess your claims in that context. If you have neither the time nor patience then consider the likely consequences of making an assertion without evidence as Ive kindly laid out above for you. In this instance it has become clear that the evidence did not exist to back up your initial assertion that releases had been brought into line with each other. See post above mine from dtg. It can be argued that unsubstantiated assertions that are false, even when made with the best of intentions, can create unrealistic expectations and disappointments, and contribute to a toxic atmosphere. If it was a life-changing event then yes I'd trawl through hours of videos to find it. I'm simply relaying what I know I heard to help clarify a situation. Whether anyone choses to read or believe it is their choice. As it happens @trainsimsteve has confirmed that was the plan so let's move on. "As we've mentioned previously, it is our plan to have parity releases on all platforms but we're not quite there just yet. For the time being, until you hear otherwise from us, releases will come to PC first and consoles as soon as possible thereafter." "As it happens @trainsimsteve has confirmed that was the plan so let's move on." Arrghhh it's only a game! Yes - it's the plan to have them same date release but not there yet. Where have I said anything different? I actually said they didn't say when! That's ok I needed a laugh! Thanks. Is there a manual or timetable? Yes, their is a manual on Steam. It's from their Facebook page. Amtrak in LIRR is a false advertisement. I just re-read the advertisement for LIRR and it doesn't mention anywhere that you would actually drive anything Amtrak. It only mentions that there is at least one LIRR station that also has connections to Amtrak services. Meaning that your passengers could depart your service and elect to board an Amtrak service from there. Nothing do to with you having the ability to drive that service. Is there going to be a timetable on service mode for this route? The last official timetable I've seen from DTG was for GWE. After that only some community members have created certain timetables. Add the diesel fleet of C3s and DE/DMs and add the gp38’s, FA cab units and C420s, Sw1001s and NYAR freight and you can take all my gawdamn munny!,!,!!! I totally agree with you on that I would love to see the DM30AC’s lirr Locomotive on a Dlc for train sim world one day then you could go to Long Island City.